The story of Joseph and his brothers, to which the Torah devotes more than a dozen detailed chapters (Genesis 37-50), is no mere family drama. The twelve sons of Jacob are the founders of the twelve tribes of Israel, and their deeds and experiences, their conflicts and reconciliations, their separations and reunions, sketch many a defining line in the blueprint of Jewish history. One such event is the tearful reunion between Joseph and Benjamin described in Genesis 45:14: "And [Joseph] fell on the neck of his brother Benjamin and wept, and Benjamin wept on his neck." The Talmud (Megillah 16b) interprets their weeping on each other's necks as expressions of pain and sorrow over future tragedies in their respective histories: "[Joseph] wept over the two Sanctuaries that were to stand in the territory of Benjamin and were destined to be destroyed ... and Benjamin wept over the Shiloh Sanctuary that was to stand in the territory of Joseph and was destined to be destroyed." The Sanctuaries are links between heaven and earth, points of contact between the Creator and His creation. "The heavens and the heaven of heavens cannot contain You," proclaimed King Solomon upon the dedication of the Beit HaMikdash. "How, then, can this house that I have built You?!" (I Kings 8:27). Yet G‑d had commanded, "They shall make for Me a Sanctuary, and I shall dwell within them" (Exodus 25:8). G‑d, who transcends the finite, transcends the infinite as well, and He chose to designate a physical site and structure as the seat of His manifest presence in the world and the focal point of man's service of his Creator. 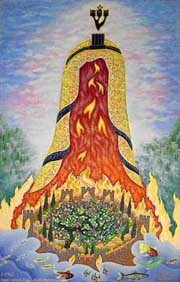 "This is the house of G‑d," proclaimed Jacob after a night at the site of the future Temples, "and this is the gate of heaven" through which man's prayers ascend on high (Genesis 28:17; Rashi, ibid. See I Kings 8:29-53). Three times a year, all of Israel came to "see and be seen" by the "face of the L-rd" at the Sanctuary in Jerusalem (Exodus 23:17, as per Talmud, Sanhedrin 4b). The Sanctuary, then, is the "neck" of the world, the juncture that connects its body to its head. A person's head contains his highest and most vital faculties — the mind and the sensing organs, as well as the inlets for food, water and oxygen — but it is the neck that joins the head to the body and channels the flow of consciousness and vitality from the one to the other: the head heads the body via the neck. By the same token, the Holy Temple is what connects the world to its supernal Vitalizer and source. It is the channel through which G‑d relates to His creation and imbues it with spiritual perception and material sustenance. "As the soul fills the body," say our Sages, "so G‑d fills the world." Just as there is a "neck" that joins the world to its divine soul, so, too, there is need for a personal "Holy Temple," Beit HaMikdash, in the life of each and every individual, a "neck" to join his spiritual head (his soul) to his material body. The human soul is a pure and perfect spark of its Creator, the source of all that is good and G‑dly in man. But in order that it head his life, man must construct a "neck" to join his soul to his material self. He must sanctify his mind, heart and behavior, so that they form a conduit through which his G‑dly essence may control, vitalize and permeate his entire being. The Sanctuary's destruction, whether on the cosmic or the individual level, is the breakdown of the juncture between head and body — between Creator and creation, between soul and physical self. Indeed, the two are intertwined. When the Holy Temple stood in Jerusalem and openly served as the spiritual nerve center of the universe, this obviously enhanced the bond between body and soul in every individual. And when man repairs his personal "Holy Temple," bridging the gap between matter and essence in his own life, he contributes toward the reconstruction of the universal Holy Temple and the renewal of the open and uninhibited bond between G‑d and creation. This explains why Joseph and Benjamin wept on each other's necks: the state of the "head" is never a cause for distress, for the quintessential soul can never be compromised or corrupted; but they foresaw times when the "neck" between spirit and matter would be damaged, alienating earth from heaven and body from soul. But why did Joseph and Benjamin weep on each other's necks, Joseph crying over Benjamin's two destroyed Sanctuaries, and Benjamin over Joseph's? Were they not distressed by the future breakdown of their own "necks"? The same question arises further on in the Torah's account, when Joseph's reunion with his father, Jacob, is described. The Torah relates that "Joseph readied his chariot, and went up to meet Israel, his father ... he fell upon his neck, and he wept more on his neck" (Genesis 46:29). Here, too, our sages explain Joseph's weeping on Jacob's neck as an expression of distress over the destruction of the Holy Temple. But what about Jacob? Why didn't he weep? Our sages tell us that he was reciting the Shema. But if it was time to recite the Shema, why was Joseph weeping? Indeed, is distress over the negative state of the connection between G‑d and His creation inconsistent with the recitation of the Shema? We see a pattern emerging: Joseph weeps over the destruction of the Sanctuaries which lay in Benjamin's province, but not over the Sanctuary which lay in his own. Benjamin weeps over the destruction of Joseph's Sanctuary, but not of his own. And Jacob weeps over neither, since, as the father of all the tribes of Israel, his province includes all Sanctuaries of Israel. The question remains: why should one weep over another's spiritual deficiencies but not over one's own? To address this question, we must first examine the nature of weeping in general. What do tears actually achieve? Tears give vent to the feelings of distress and frustration that accompany the knowledge that something is not as it should be. After a "good cry," a person is somewhat relieved of these feelings, although the situation that prompted his tears remains unchanged. Is this a positive phenomenon? At first glance, it would seem not. Distress and frustration are what drive a person to rectify the negative reality that gave rise to them. To lessen them by other means would seem to counteract their purpose and utility. But what if one has done all there is to be done? In such a case, where weeping cannot be faulted for reducing the impetus for action, one can point to its constructive uses. It may serve to communicate one's empathy with a fellow's troubles. And it may serve to alert others to the gravity of the situation — others who are in a position to do something about it. Citing the verse (Isaiah 52:2), "Shake yourself from the dust ... O Jerusalem," the Midrash expounds, "As a rooster who shakes off the dust from his wings." Our sages explain: when a rooster has wallowed in the dust, a thousand people with a thousand combs cannot clean it; but with a single vigorous shake, the rooster can free himself of every last speck of dust. One can educate, inspire, drive and otherwise assist another to develop and improve himself; ultimately, however, the only one who can effect any real and lasting change is the person himself. Thus, Joseph and Benjamin allowed themselves to weep over the destruction of each other's Sanctuaries. Ultimately, only Joseph can repair the destroyed Sanctuary at Shiloh, the "Joseph" dimension of Israel's relationship with the Almighty; Benjamin can only encourage and assist. After contributing all he could to Joseph's efforts, Benjamin wept his agony and concern on his brother's neck. The same applies to Joseph's weeping over the Sanctuaries in Benjamin's domain. However, concerning one's own spiritual ills, there is no such thing as "having done all there is to do." G‑d has granted free choice to man and has provided him with the resources and abilities to overcome his every moral and spiritual challenge. Hence the tearless approach of Jacob, Joseph and Benjamin to the destruction of their own Sanctuaries. To weep over one's own "neck," over the negative state of the relationship between one's own body and soul (and its cosmic repercussions in the relationship between G‑d and creation) is counterproductive, as it relieves and diminishes the internal forces that compel one to repair the relationship. Instead of weeping over the destruction of the Holy Temple and the resultant galut ("exile"), Jacob recited the Shema — the Jew's proclamation of the unity of G‑d and the imperative to translate his comprehension and awareness of G‑d's unity into thoughts in his mind, feelings in his heart, words in his mouth and concrete actions in his physical life. Instead of giving vent to his pain, Jacob directed his inner turmoil toward the endeavor of rebuilding the damaged necks of Israel. I really enjoyed this essay; the concept seems so simple but is very difficult to express and the author seems to have done an excellent job of it.